Most relationships are an adventure, but for Sam and Mel, the word takes on a different meaning. Forging their relationship by hiking up mountains, watching sunrises, sunsets, and meteor showers, and driving for days to see National Parks, their friends eventually labeled them “Smel” – a combination of their names in the same vein as “Kimye” or “Bennifer” (the second one). Not content to leave it just to a cute couple name though, the phrase, “#doyouSMELadventure” was created, and its hashtag is now visible on every photo and video that they post from one of their adventures. With their adventurous spirits in mind, is it any surprise that Smel decided to get married in one of the most unique and beautiful countries on Earth? A country they hadn’t ever been to before their wedding? Iceland, with its glaciers, waterfalls, and volcanoes just waiting to be explored would be their greatest adventure! In all, we spent three incredible days with them, including a 5am wakeup on the wedding day to watch the sunrise, followed by a three-hour bus ride to the Jokulsarlon Glacier Lagoon, where they chose a spot to say their vows. We explored with them the next day as well, visiting secret caves, climbing mountains, and watching the northern lights dance overhead. For Smel though, it was clear that their adventure isn’t about all these places they have traveled to; what is important is that they have experienced them together, and that their love and relationship is the adventure. While this film does represent the awe-inspiring beauty of Iceland’s landscape, we filmed and edited it with a focus on who Sam and Mel are together. 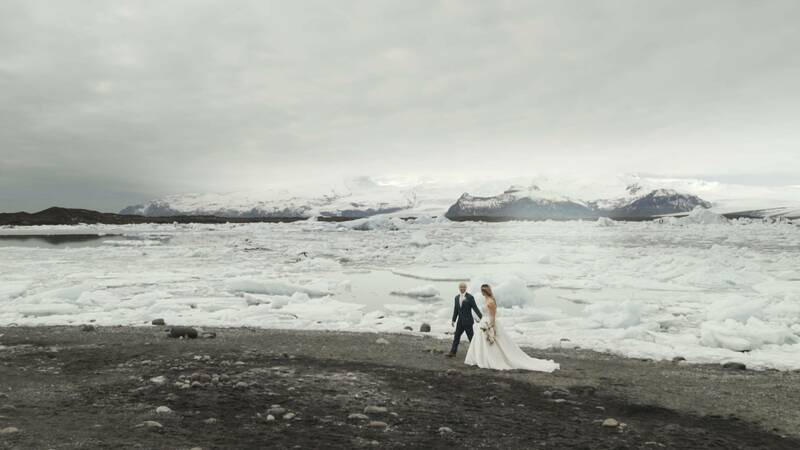 It may not be your typical Iceland wedding film, but it is something that is completely Smel. Getting married in Iceland or anywhere else? We would love to film it! Please get in touch.